The Ovahimba Years: Work in Progress exhibition provides a window on the results of five years of multi-facetted research on Ovahimba cultural heritage within the community of Etanga, a settlement in the north-western Kunene region of Namibia. Since 1998, anthropologist and filmmaker, Rina Sherman has been living on oHere Hill in the outskirts of Etanga with Headman Ukoruavi Tjambiru and his extended family. During these years, she has documented by means of film, video, photographs, writing and sound recordings, everyday life, rituals, ceremonies, thought systems and beliefs of the Tjambiru family and an extended circle of relatives and neighbours in Etanga and its outlying districts. Whilst research on the cultural heritage of a people represents a rather broad base for a field of study, Rina Sherman has chosen to follow the itinerary of a few key members of the Tjambiru family and has captured moments of their lives that are representative of contemporary Ovahimba lifestyle. 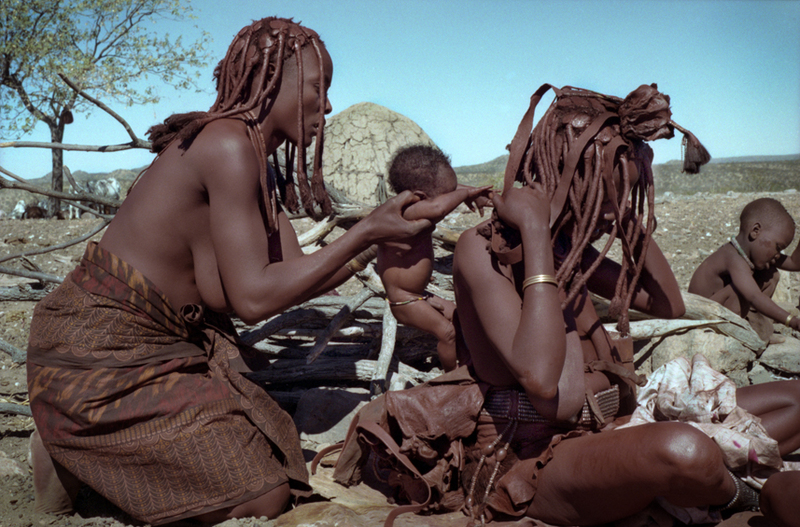 In this way, the spectator shares in family, ritual and ceremonial moments; evocations of the past through historical praise singing, the present through everyday life and ritual scenes, and the future through an exploration of Ovahimba aspirations within the context of Namibia as an independent country. Nuku Tjiuumbua's waterhole, Etanga 2002. During the first week of the exhibition, a group of young people from Etanga will perform various Ovahimba dance practices, followed by an explanation of their application within the context of their culture. These young people act as spokespersons for Ovahimba culture, and share elements of their history, ways and customs and future aspirations with members of the public. The presence of the Etanga Youth Group is an essential component of the exhibition. During the first week the focus of activities is on the participation of the Etanga Youth Group, in the form of informal discussions about various aspects of their culture and live performances. For the remaining period of the exhibition, the emphasis of the adjacent programme shifts to the presentation of a selection of films and scholarly talks. The exhibition consists of a series of composed soundscapes, punctuated with photographs, drawings, cultural objects, films, unedited images and writings, each reflecting multiple facets of everyday and ritual life. The display opens with a stairway or elongated space in which a few soundscapes introduce the spectator into various aspects of Ovahimba life: singing to call the coming of the spirits, praise singing, working with the cattle, and interpreting the spirit language. The space then opens into seven soundscapes separated by isolating walls and interlinked by a central soundscape. The external and internal walls serve as a support on which the photographs and the drawings are displayed. The various volumes created by the soundscapes form the spaces in which cultural objects are exhibited in glass display boxes mounted on wooden stands. The walls of the soundscapes are treated with insulating materials in order to create a degree of sound isolation for each soundscape. The soundtrack of each soundscape is of varying length, recorded in a loop and programmed by a central computer to play continuously for the duration of the opening time of the exhibition. A certain spill over of sound from one soundscape to another is intended, and hence the continuous sound composition is never heard in exactly the same combination. In an adjacent screening room, unedited images of the video and film collection of The Ovahimba Years Project are shown continuously, presenting extracts of everyday life, conversations on topics such as spirit taking, customary law, rituals and ceremonies of various kinds, such as circumcision and spirit taking. As with the rest of the exhibition, these images run continuously and the spectator can enter any aspect of the display at any given point in time and space. Concurrently to the exhibition, a programme of edited films from the Collection of The Ovahimba Years and specialist papers on topics such as the Ovahimba kinship system and the sacred altar belief system are presented. A reading corner forms part of the exhibition to which visitors can retreat to read a variety of unpublished (and published if the case) writings in progress. The Collection of texts contains Progress Reports, articles, stream of consciousness essays and extracts from field notes and journal, as well as recorded conversations with members of the community of Etanga. An individual label introduces each display - soundscapes, photographs, drawings, cultural objects, and un-edited images - explaining contents and placing them within the context of Ovahimba life and belief system. These short accompanying texts are conceived to be both informative to scholars and accessible to members of the general public. As a whole, The Ovahimba Years: Work in Progress is a slice of the life and times of the community of Etanga and their relatives and neighbours. Whether visitors are informed scholars or interested non-specialists, the exhibition is designed in such a way that they should leave the space with the impression of having spent time with the Tjambiru family on the hill of oHere in Etanga. and the latter's "mama ngero" or "young mother", Mukaandjaou. A group of ten young people from Etanga attends the opening and the first week of the exhibition. They act as spokespersons for their culture, and share with members of the public elements of their history, everyday lifestyle, cattle farming systems, material culture, belief system and also their aspirations for future development within the context of an independent Namibia. During their stay, they provide daily performances of traditional dance practices, such as ondjongo playing or ombibi dancing and subsequently explain to the audience the various contexts within which each dance practice is practiced. The photographs (colour and black & white) of small, medium and large sizes and the drawings (pen and colour crayons) of small and medium sizes are all framed in simple thin and broader black frames with eggshell passe-partouts, which provides a homogenous and sober context to these elements of diverse content and treatment. They are hung on the inner and outer walls of the soundscapes according to theme, place or activity. The exhibition displays about seventy frames. A selection of cultural objects is displayed throughout the exhibition: at the entrance, in some of the soundscapes and in the central and seventh soundscape. The objects are disposed on simple rods or hanging from the top glass pane of the glass and matt steel display boxes mounted on wooden stands raising them to the average height of visual comfort. A label provides information on the origin, ownership, context and usage for each object. The exhibition counts eleven soundscapes, four of which are dedicated to the entrance in the form of a stairway, elongated space or any other adaptable space. The four introductory soundscapes emanate from speakers placed along the stairway or other space, and the different sounds from each speaker flow from the one to the other. The four initial soundscapes of the exhibition. Insulated walls separate the seven remaining soundscapes. Each has a different sound track, over-spilling slightly from one into the other. Each sound track of varying length is recorded in a loop on a separate mono or stereo track of a computer and is diffused by speakers hidden at the top of the soundscape walls. The global effect as the visitor moves through the exhibition is that of a constantly varying composition due to the varying lengths of the sound tracks and depending on where the visitor is situated and at which point in time he or she enters the exhibition. At the entrance of each soundscape, a label provides information on the origin, date, and names of individuals and context of the recording. In an adjacent screening room, extracts from the collection of footage of The Ovahimba Years Project is screened continuously. At the entrance information is provided regarding content, times and the general orientation of the project and the way of filming. The ongoing screening of unedited images provides the viewer with window in real time on Ovahimba everyday and ritual life. A programme of completed films from The Ovahimba Years Collection and other relevant films are screened concurrently with the exhibition. A general programme provides notes on the films, information on the exhibition and the catalogue that is for sale. During the run of the exhibition, scholars present special interest papers on topics related to Ovahimba cultural heritage. Amongst the guest speakers, are Rina Sherman, and Dr. Jekura Kavari, Ph. D. graduate of SAOS and Senior lecturer in the Department of African Languages at the University of Namibia. Topics addressed include fieldwork, multi-disciplinary research in the field of anthropology, heritage and kinship systems of the Ovaherero, the sacred altar belief system, living with the spirits, etc. A specially designed catalogue is published for the exhibition which features the corporate design of The Ovahimba Years Project. It contains standard catalogue information, as well as introductory materials to the aims and achievements of The Ovahimba Years Project in terms of research on the cultural heritage of the Ovahimba and community development activities. Furthermore, it contains a selection of photographs of elements displayed in the exhibition, including photographs drawn from the moving image collection of the Project. The expression in Otjiherero, language of the Ovahimba, for entering into trance, is: "okukambura ozombepo", which literally translated means, "to take spirits", hence the choice of the expression "spirit taking" in English. Stream of consciousness, a procedure used by Virginia Woolf, in which the author reflects on the world from a subjective point of view, following a course of thought and consciousness, that progress through an association of ideas. Ondjongo, a game that has various applications; it is played for both therapeutic reasons and simply to have fun. Ombimbi is a war dance during which the heroic acts of the deceased are evoked. The School of Oriental and African Studies of the University of London.